In 19th century Britain men and women inhabited, what was thought of at the time as, ‘separate spheres’. This gender ideology rested on a patriarchal model, where power and privilege were reserved for men. The idea of ‘natural’ male supremacy, with women considered physically and intellectually weaker and best suited to a domestic sphere. Educating women was not considered to have any value and opportunities for seeking employment limited. When the young Sophia Jex-Blake decided to pursue a career as a doctor and applied to study medicine in 1869, she chose the University of Edinburgh for the city’s enlightened and liberal attitudes towards education. She received an initial rejection from the University Court, along with fierce opposition from many staff and students, on the grounds that the university could not make the necessary arrangements “in the interest of one lady”. Sophia therefore advertised in The Scotsman newspaper appealing for more women to join her, which they did. The Edinburgh Seven, as they would come to be known, successfully applied and became the first women to be matriculated to a British University. Sophia Jex-Blake, Mary Anderson, Isabel Thorne, Edith Peachey, Emily Bovell, Matilda Chaplin and Helen Evans. The women’s time at the University of Edinburgh went anything but smoothly. They had to arrange their own lectures, receive tuition in separate classes from men, pay higher fees, and as they demonstrated their abilities in their studies hostility towards them only grew. A defining moment in the women’s fight took place on 18 November 1870 as they arrived at Surgeons’ Hall to sit their anatomy exam. As they approached the building they were faced with a large angry crowd of students, and several hundred onlookers, who threw mud and rubbish as well as insults at the women. ‘The Surgeons’ Hall Riot’ was widely reported in the press, leading to increased awareness of the Edinburgh Seven and their fight for equality in education. Discrimination from the university continued and in the end the women were unable to graduate in Edinburgh, instead travelling to Bern and Paris to gain their degrees. However, the campaign of the Edinburgh Seven, led by Sophia Jex-Blake, put the rights of women to a university education on the national political agenda. Legislation was put in place, the UK Medical Act 1876, to ensure women could study medicine at university. In 1894 the University of Edinburgh allowed women to graduate, with the first doctors graduating in 1896. In this work I explore transitions and relationships between people and place, light and dark, patriarchy and domesticity, equality and inequality and how the collective power of enlightened women can brighten the fabric of society. The fight for equality goes on to this day, with many women and girls across the world still without the right to an education. The campaign that these seven women began in Edinburgh in 1869, however, was a defining moment in the progress of equality. 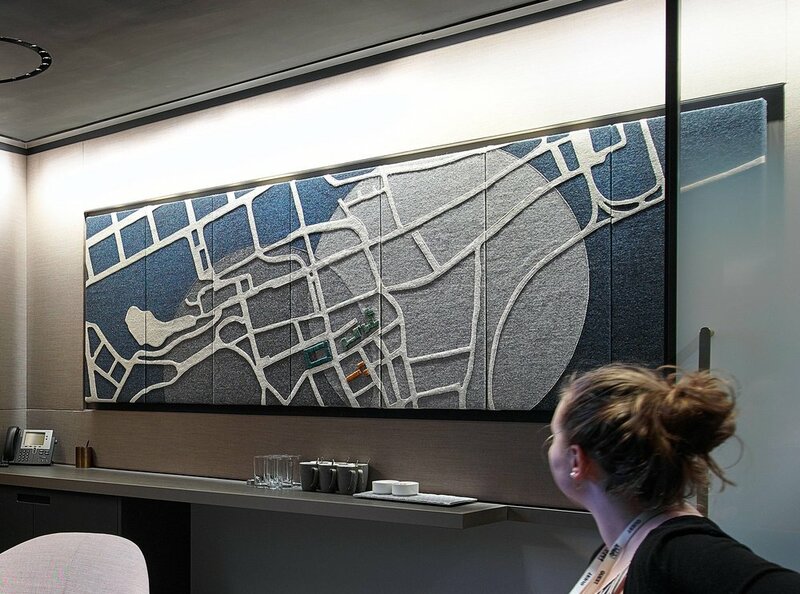 This work was commissioned by KPMG as part of the workplace transformation of their Saltire Court premises in Edinburgh. The wonderful women of Michael Laird Architects & Interior Design, Esther & Hazel, for their inspiration and enthusiasm from the very start of the project. Dr Elaine Thomson of Napier University, for bringing her research to life. It was during Elaine’s talk on the history of women in medicine, that the images started to form in my head. I was also privileged to see a rehearsed reading of ‘Edinburgh 7’, a new musical being developed by Jordanna O’Neill, John and Martin Keilty, in which Elaine set the scene with her words.